Staff Photo by Dan Henry / The Chattanooga Times Free Press- 4/3/16. Dale Holdaway, originally from Michigan currently living in Brazil, makes his way up the Chimney Top Trail on his third loop during the 30th running of the Barkley Marathons at Frozen Head State Park in Warburg, Tenn., on April 3, 2016. This was Holdaway's fifth attempt and he missed the 40-hour "Fun Run" (3-lap) cutoff by a few hours upon completing his third lap. 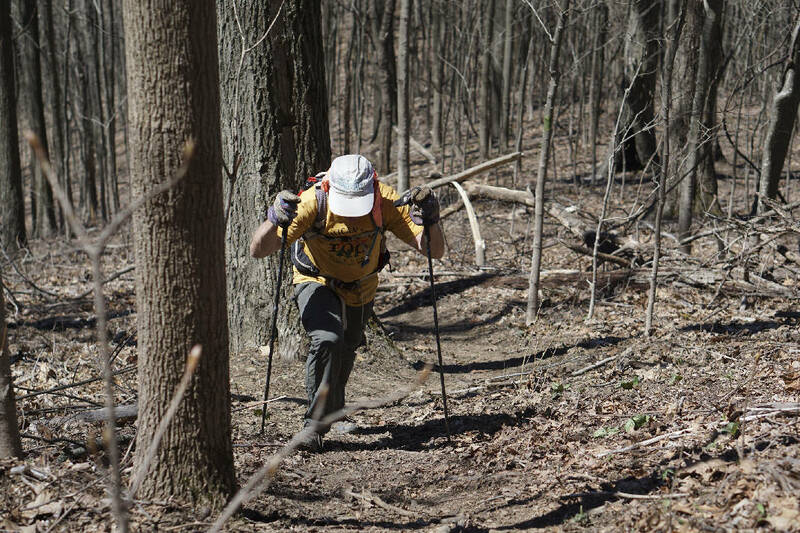 The Barkley Marathons is in its 30th year and consists of part orienteering and part ultra marathon where a select few attempt to complete five 20 mile loops within a 60-hour time limit where they search for hidden book caches deep in the woods throughout the park. Deep in the rugged mountains of rural East Tennessee, a foot race is pushing the limits of human capability. At close to 130 miles and with 65,000 feet of climbing, some say it's the world's toughest trail race. But it measures more than just speed and endurance. And most have never heard of it. For decades, the race has lived below the radar of general public awareness, its location and date known only to its inner circle and a group of devoted fans who anxiously await its arrival each spring. But on a recent Friday morning, dozens of cameramen and spectators descended on a small state park near the old Brushy Mountain State Penitentiary to witness the spectacle that is the Barkley Marathons. A small crowd surrounded Gary Cantrell, known as "Laz," as he sat down at a picnic table Saturday, popping the top on a can of soda. "People ask me all the time if I expected this," Laz said as the assembled people bounced their eyes between the bearded 60-something and a conch shell nearby on the wooden table. "I wanted a race that people got excited about," he continued. "But I could never have predicted all this." Laz can hardly blink without having a camera documenting it these days — at least on the weekend of the Barkley Marathons. And this weekend proved once again that all the commotion is for good reason. A few minutes after cracking open the drink, Laz picked up the shell, stepped to the front of his elevated campsite and puffed. The shell offered little more than a subtle croak on his first few efforts. Finally, at 9:43 a.m., the conch shell sounded, resonating through the trees and signifying an hour until the start of Tennessee's most treacherous foot race. Cheers wafted up from the campground below, where 40 runners from around the world, nearly all assured failure before ever passing the starting gate, emerged from tents and campers to make final preparations for the challenge of a lifetime. They stuffed their faces with calories and carbohydrates and anxiously began stretching. Here, in an isolated East Tennessee mountain cove, a new group gathers each spring to subject itself to the sinister combination of Laz's wit and the treacherous terrain surrounding them. All had been calm Friday as runners arrived and brought Laz their entry fee: $1.60, a license plate from their home state or country, and a T-shirt with a foreign language on it. Race entry always requires $1.60 and the license plate. But the rest of the entry fee varies by year based on what Laz needs at the time. One year it might be socks, another year it might be flannel shirts. But now, on Saturday morning, with the quirky entry fees settled and the race imminent, the nerves of the competitors became evident. "There's something wrong with you if you aren't at least a little bit nervous," said 39-year-old John Fegyveresi, who was among a record three Barkley Marathons finishers in 2012. Only 14 of more than 800 runners have finished the race since Laz extended it to its current 100-plus mile length in 1995. Those who do finish are sleep-deprived, delirious and at the brink of complete exhaustion after completing five 20-plus-mile "loops" through the cascading mountains. And so are many of those who come nowhere close to finishing. None of the 40 competitors completed the race in 2015, and just one finished this year. The Barkley Marathons is not just any race. It's known as the race that eats its young. This year, the race bibs read: "Where dreams go to die." To truly understand the Barkley Marathons, a trip to Petros, Tenn., is a necessity. Tucked against the mountains about half a mile away from this tiny town's main intersection is the old Brushy Mountain State Penitentiary, a facility recently purchased by three Chattanooga businessmen after its closure in 2009. Laz's motivation for starting the Barkley Marathons stemmed from the prison's most notorious escape. Martin Luther King Jr.'s killer, James Earl Ray, escaped from Brushy Mountain in 1977 and made it just eight miles through the treacherous mountains before he was captured several days later. Laz, thinking that was a puny effort, set out to test human ability against those same mountains that had contained Ray so effectively. The Barkley Marathons take runners beneath the prison in a dark tunnel. It's a signature portion of a race that has many infamous stretches. It was added once Brushy Mountain ceased operations. The race can start any time between midnight on Friday and noon on Saturday, based on when Laz decides to sound the conch shell. A 9:43 a.m. sounding of the conch meant the race would start when Laz lit a cigarette at 10:43 a.m. That start time gave runners until 10:43 p.m. on Monday night to finish within the race's 60-hour time limit. Runners hearty enough to complete three loops — more than 60 miles — in 40 hours are finishers of what is dubiously termed the "fun run." By Monday morning, only three competitors still had a shot at finishing this year's full Barkley Marathons. And they were the only three to complete the fun run. As runners trickled back into camp over the weekend with spectacular accounts of failure involving mental, physical or navigational follies on the race course, Laz encouraged them to go sit by the fire and share their stories. Many chose to stick around and do just that. There is no particular mold for Barkley runners. Many hold advanced degrees and work in science and engineering fields. But they are young and old, male and female, and they hail from all over the world. And they are a family united in the goal of conquering this inhumane race. This year's field included runners from Australia, Norway, France, Holland, Germany, Austria, Sweden, Brazil, Canada and Japan. The Barkley's first legally blind runner, a Canadian named Rhonda Marie Avery, entered with the goal of running until someone made her stop. She returned to camp with her guide runner after 31.5 hours on the first loop of the course. Three runners in this year's race set a record for futility. It took them 32 hours to complete the first loop, well beyond the 13-hour, 20-minute maximum. Still, the three were applauded like victors as they trudged into camp Sunday night with the sun beginning to set on the race's second day. Merely attempting the Barkley is a feat. While the sheer idea of running more than 100 miles is mind-boggling to most, there is nothing particularly unprecedented about the distance of the Barkley Marathons. Though the official distance is 100 miles, all agree the true distance of the race is more like 130 miles. In the Chattanooga area, the Thunder Rock 100 is an example of a 100-mile trail race. That event is put on in the Cherokee National Forest and features 16,100 feet of climbing. The Barkley is unmatched in its level of elevation change, however. Runners who complete five loops traverse 130,000 feet of elevation change. The extreme ascents wreak havoc on the body and the mind, competitors say. And the descents are so steep and treacherous that they bring additional pain instead of relief. The Barkley is also unmatched in its traditions and idiosyncrasies. Runners prove they have completed the course after each loop by presenting Laz with a page corresponding to their bib number from 13 books hidden across the course. In Avery's honor, one of the books on the 2016 course was Braille. Compasses are allowed, but cellphones, GPS devices, altimeters and other electronic devices are not. There is one "master map" that all runners must work from, and they are given vague instructions prior to the race to help them find the books. Only a small portion of the trail is marked, the rest takes place in rugged wilderness. Wrinkles like these are what runners will not encounter anywhere other than the Barkley. They have Laz's outlandish personality written all over them. "It's so much harder than I expected, and I was expecting it to be really hard," competitor Gary Robbins told Laz Saturday evening after completing his first loop in a swift eight hours. Laz offered a pleased grin in response. Robbins was a notable addition to the field this year, a 39-year-old Canadian and first-time Barkley runner, or "virgin," who is one of the best 100-mile runners in the world. As they finish each loop, runners touch a yellow gate in the campground and present their book pages to Laz. They are then allowed to head to their campsites to refuel and replenish their backpacks before heading back out. They can nap if they have time to spare before the cutoff times for each loop arrive. While three loops in under 40 hours constitutes a fun run, competitors must complete the first three in 36 hours if they wish to continue. Robbins and 39-year-old Salt Lake City resident Jared Campbell completed the third loop together in about 30.5 hours. Both slept — or at least tried to sleep — for about 75 minutes between Loops 3 and 4 on Sunday night to alleviate the inevitable effects of sleep deprivation. A third competitor, John Kelly, attempted to nap after finishing his third loop in about 32 hours. But he couldn't fall asleep. Kelly, a 31-year-old Maryland resident who was born in the nearby community of Joyner, Tenn., was just an hour behind Robbins and Campbell after the fourth loop but showing clear signs of exhaustion as he prepared to begin a fifth loop that he was unable to finish. Kelly, who is scheduled to run the Boston Marathon in two weeks, zigzagged into camp after his fourth loop, walking with a wayward gaze, looking like a driver who was about to fail a sobriety test. It was nearly 48 hours since the race's start and about an hour after Robbins and Campbell had departed in opposite directions for their fifth and final loops. After limping onto Loop 5 Monday morning caked in mud and with cuts all over his body, Kelly lay down just a few hundred feet from the yellow gate for what would have been his first sleep in more than 48 hours. He had 12 hours left to finish. "He's really out of it," said Fegyveresi, who battled similar exhaustion after Loop 4 before finishing with 19 minutes to spare in 2012. "I don't know what he's going through mentally. "Physically, he's right on par for this course." Fegyveresi and Andrew Thompson, another previous Barkley finisher who stopped short of Loop 5 this year, helped put Kelly back together as he prepared to attack his fifth loop. They worked alongside Kelly's wife and family in the shadow of the mountains, one of which is named Kelly Mountain after John Kelly's ancestors who settled in the area in the early 19th century. As Kelly began his fifth, and ultimately unsuccessful, loop, he trudged up the trail to the spot where he soon collapsed for a nap. Fegyveresi watched with a grin. "This is Barkley," he said. For all of its insanity, the race has kept a relatively low profile since Laz created it in 1986. There is no official race website with the race date or instructions on how to enter. Participation is capped at 40 and a common phrase is that it helps to "know someone" if you wish to enter the race, even as its reputation has grown. Laz is selective, choosing only runners who apply on exactly the right day and fit his eye. He quit counting how many applications came in, but said he has received 700 applications for races in the past. Slowly, but inevitably, given the event's nature, media outlets have caught on. The New York Times, Washington Post and Outside Magazine have covered the Barkley Marathons in the past decade, as have various documentary makers. But even before the press disseminated the madness of the Barkley to the masses, the race had an international appeal. In 1995, after Laz increased the race from three loops to five, the first finisher was from England. The strong international presence has persisted, while the race still falls largely below the radar of most non-runners, even those in the Barkley's backyard. Members of Kelly's family, who came from just down the road to support him, said they only learned what the race was all about in 2015 when John, an Oak Ridge High School graduate, competed in it for the first time. A wider swath of the general public is beginning to learn of the bizarre human phenomena on display at the Barkley Marathons. A documentary on the 2012 race appeared on Netflix on March 1 and is bringing the insanity of the Barkley Marathons to its largest audience yet. "It's like it's a public thing now," said Ed Furtaw, a legend who was the race's first finisher in 1988. Furtaw, better known as "Frozen Ed," penned a 2010 book about the event called "Tales From Out There." He said the Netflix documentary made March the best sales month for his book since its release six years ago. "But it's different now. It used to be that you'd just come out here to get humiliated and enjoy the woods," he said. "Now it's like we're heroes and legends." The increasing notoriety has led to moments like the Saturday morning scene with the conch shell, where Laz was watched by cameras as if he he were a Hollywood star or professional athlete. "Everything in life changes," Laz said Saturday morning around 1 a.m. as he waited at the gate in a quieting campground with 14 runners still traversing Loop 1. "The most important thing to me is that the experience itself is a highly personal experience. They may have been intruded on some in camp. But right now, they're out there by themselves." Laz, who is a volunteer assistant basketball coach at Cascade High School in Wartrace, Tenn., considers himself semi-retired. He is a director or co-director for six races, including the new Race for the Ages in nearby Manchester, Tenn. He's always been a runner. He said he was staying at a motel in the West Tennessee town of Bolivar during a long-distance run many years ago when he flipped through a phone book and was drawn to the names of Lazarus Lake and Lazarus Lake Jr. When he signed up for an email account many years later, he entered his name as Lazarus Lake, and the name stuck. He plans to run across upper East Tennessee's Unicoi County this year. It will be the last of the state's 95 counties that he has run through. "I know Tennessee's geography and the lay of the land as well as probably any man alive," he said. He said that you don't direct races to get rich or famous. The Barkley Marathons has made him famous, but certainly not rich. "The Barkley is a labor of love," he said. The sound of taps being played on a bugle echoed through the campground, a reminder each time a runner quit the race. But many chose to stick around, waiting for those still on the trail. Robbins and Campbell ran together for the first four loops, with Campbell, a race veteran, coaching Robbins on how to handle the intricacies of Barkley. But when they reached the fifth loop, they were required to go in opposite directions. Eventually, exhaustion overtook Robbins, who said upon returning to camp that he was hallucinating. Finally, with about 30 minutes left to spare before the 60-hour cutoff, a headlamp came bobbing into the campground. It belonged to Campbell. Cheers rose from around the yellow gate as he approached. Campbell leaned in to kiss the yellow gate as he became the first three-time finisher in Barkley Marathons history. "Sorry to keep you all waiting," he said as he handed his final 13 pages to Laz and took a seat. "How's life been around the campground?" he asked. "I want to hear some stories." This story was updated April 6 at 12:45 p.m. to clarify that runners who complete five loops traverse 130,000 feet of elevation change.